Mashed potatoes have to be my ultimate comfort food – if I were stranded on a desert island and had a choice of only one thing to eat, potatoes would probably be my first choice. And if I were watching what I eat but still wanted hearty potato flavor? I’d choose to make Simple Rustic Mashed Potatoes. Umm. wait! I need a little milk and a smidge of butter, too. And salt, please? Dang, maybe I should have just chosen ice-cream after all! In the last decade or so the potato has fallen from the rank of “superfood” to near vilification as the sweet potato has risen to the ranks of stardom. The truth is somewhere in the middle; both our plain old potato and the sweet potato bring something to the table; each has its own blend of important nutrients. And in both potatoes, the majority of the nutrients is right under the skin. The potato, like many foods, isn’t necessarily bad by itself, but the problem with the potato is the same one that’s plagued those who live on a budget for centuries: Potatoes are downright delicious and it doesn’t hurt that they’re cheap, filling and keep the navel from touching the spine as they say. It’s easy to serve up huge servings of the cheaper items in the meal. If you’re serving potatoes, they’re taking up space on your plate and in your diet that could potentially be taken by more nutritious items. Potatoes are fat, sodium and cholesterol free and do bring more potassium than a banana to the table as well as quite a bit of vitamin C, but pale in comparison to some of the other vegetables. And we can’t forget that potatoes are a perfect foil for almost anything fattening you want to throw at them: butter, cream, sour cream, cream cheese, bacon, cheese, and so on. It’s easy to load your potatoes up with all kinds of stuff that’s really not so hot for ya. So while I might go all out for company, a special dinner or a holiday, I like to make these Simple Rustic Mashed Potatoes for every day. They have just smidge of butter and a whisper of salt and the potato flavor just shines through. 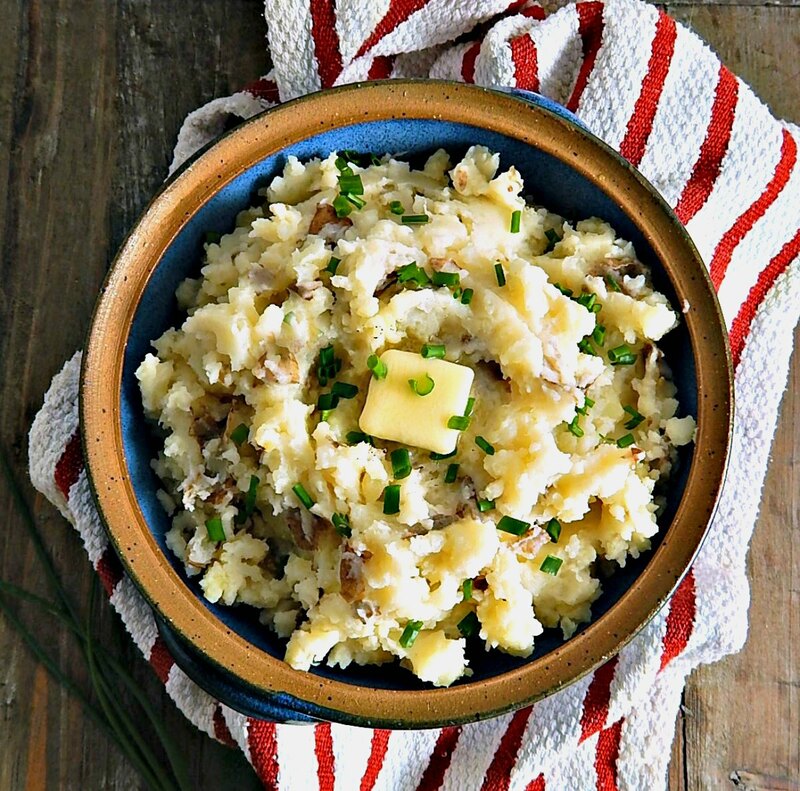 If you are looking for something even healthier than my Simple, Rustic Mashed Potatoes, think about this Parmesan Cauliflower Mash. Boil the potatoes in their jacket, whole if they’re small but just cut in half if they’re larger. Potatoes cook faster when they’re cut in small pieces, but taste better if they’re cooked whole or in larger pieces. And the more flavorful the potatoes, the less likely you are to want to add a lot of “stuff” to make them taste good, right? When you’re making Simple Rustic Mashed Potatoes, the more you smash and mash them, the starchier they’ll get and the more milk you need. These are meant to be rustic and chunky and drop-dead simple, so watch it and hold yourself back a bit. Mashed potatoes are pretty cheap to make, especially this healthier version that has very little butter and just plain old milk. I kind of try to trick the eye. I always make sure that I have at least a little pat of butter right on top and I swear it makes me think there that there is more butter and more richness in the potatoes than there is. And I know better! Since I like to NOT have any leftover mashed potatoes, I try to get as close to the mark as possible. In my family, it seems that no matter how many I make, they’ll get gobbled up, so I try to minimize gluttony by making “just enough.” If you have a kitchen scale, you can weigh your potatoes until you get the idea of what a medium-sized potato looks like or you can judge by the bag: check the pounds in the bag, and visualize how many are a pound, then add another to make the 21 ounces (approximately) you’ll need for the recipe. If you do have leftover mashed potatoes, think Potato Cakes. Potatoes are always cheapest in the larger bags and keep well in a cool dark place (like a loosely closed paper bag) away from onions. Since the large bags often have odd sized potatoes, I go through and pick out the larger uniform ones for baking or other recipes where size matters and use the smaller or oddly shaped ones in recipes like these Simple Rustic Mashed Potatoes where it doesn’t make a difference. Add potatoes to a large pot along with salt and water to cover. Bring to a boil, turn down to a good, hard simmer and cook for 20 to 25 minutes until tender. Cook until easily pierced with a fork or knife. Drain and return potatoes to pot to keep warm. Mash by hand with a potato masher to desired consistency. Add the three teaspoons butter and milk, buttermilk or broth and stir until combined. Add salt and pepper if desired. Add the last teaspoon of butter to the top and garnish as desired. Keep covered to keep warm. Note: The proportions work well for a rustic, rough mash. For a very smooth mash, more liquid may be needed. This entry was posted in Click here for Fabulous Food Posts and tagged hearty sides, mashed potatoes, Potatoes, Side. Bookmark the permalink. Potatoes are a staple of our diet. Moderation is the key, as you mentioned. Sweet potatoes cost more here (Canada) so sometimes I’ll cook them together. It stretches the sweet potato, and I don’t need as much ‘toppings’. When we do have baked potatoes, we pile on lots of vegetables as toppings (onions, peppers,tomatoes,mushrooms etc), topped with greek yogurt (instead of sour cream) and cheese. Hi Kathryn – those are great ideas for toppings! I use yogurt often in a lot of recipes instead of sour cream, but I don’t think I’ve ever used it as a potato topping. I’ll have to try it next time! Now I’m thinking I might try yogurt IN my next batch of mashed potatoes. Sweet potatoes are generally more expensive than regular potatoes here, too. Standard pricing (not sale pricing) in my area tends to go (at the lowest) Russet, then Red Bliss, then Sweet Potatoes. The baby or smaller versions of any of them cost more, and fingerling potatoes or any of the specialty potatoes (like the blue ones) are really expensive! They say there are 4,000 varieties of potatoes, and about 100 varieties are sold in the US, but generally we only find a few in our grocery stores. Makes me wonder sometimes what I’m missing out on! If I top them with broccoli, a home made cheese sauce goes good too.I used to make the sauce with milk, but the last time I only used water, and I liked it better. One of my kid’s favorites – baked potatoes topped with left over chili and cheese. They’d get home from school (and of course, they were always “starving”) and they’d microwave a potato so they could make it as a snack. They were the ones that taught ME that there was a special button on my microwave for potatoes! lol! Me – I always thought it was an odd combo! I didn’t mention your comment about making cheese sauce with water right away, but it kept popping into my mind during the last few days. At first, I just wondered about what you said, which frankly (no offense) seemed a bit on the odd side, but I think my mind was working on it subconciously. I started thinking about my brownies that I make that taste so incredible. Pure chocolate flavor. I use water to bloom the cocoa and it makes a huge difference in bringing out the pure chocolate flavor. Milk dulls the flavor of chocolate; milk chocolate is not as intense as other chocolate. I’m betting that you came across the same with your cheese sauce. While we always think of cheese sauce with milk in it, perhaps that milk is what makes things taste less cheesy. You’re probably getting pure cheese flavor when you’re using water! I’m going to think about this next time I make a cheese sauce for something like broccoli, too! Believe me, it really surprised me too. I was making the sauce and realised I was low on milk, and so gave it a try.My mother always made it with milk, but I cut my milk 50:50 with water, when baking…and over the years, I was cutting it more and more with the cream sauce. I had chocolate cake recipe too, that took boiling water with the cocoa. The batter was really runny, but it made the lightest, texture of cake..almost like a cake mix..and very chocolaty. (probably because she only had two round cake pans) she made one layer in a springform and it oozed all over the oven because it was so thin. Disaster! Her house was filled with smoke and the oven had to be cleaned. I have been trying to cut back more and more on dairy altogether just for health reasons. Here in the US, we always think if a little is good, a lot is better. I shudder a bit to think of how much dairy we used to go through, and of course I instilled that in my kids. While all the nutrition boards always said equivalent of three cups of milk a day which included yogurt, cheese and other milk products, we always had 16 ounce glasses and I thought nothing of the kids filling theirs up more than once, all while serving food with cheese on it, etc., etc.